Steve writes: This zone was inspired by plans to perform at the Los Angeles Center Studios’ Vortex Dome in 2013. Entering this space created an immediate immersive experience, even with no music or visual stimulation. Vortex Immersion Zone was born from this geodesic, womb-like space in the same way a natural environment or magnificent cathedral inspires an artist to explore new places within. Over the course of time, portions of this immersion atmosphere appeared in concerts which in turn would help to magnify how I was hearing-seeing into this piece. The potency and allure of this sonic space directed me to shape and shift the experience into a new depth as it was completed in late 2015. The original inspiration for progressive-electronic/ambient pioneer Steve Roach’s Vortex Immersion Zone came from rehearsals for a live performance at the Vortex Dome at the Los Angeles Center Studios in 2013 (the results of which can be found on the superb double CD set Alive in the Vortex released in December 2015), as well as pieces of music that originated from the concert itself. Over an almost three year period, certain ideas evolved into the seventy-three minute long-form self-titled piece presented here, and in a year full of endlessly inspired releases from the artist, this one might just be one of the very best of them. Vortex Immersion Zone is darkly psychedelic, eerie and mysterious with surprising moments of great heaviness, the slyest of subtle grooves and plenty of the expected droning ever-evolving Roach soundscapes. A churning psychedelic ripple spirals and unfolds in and out of the entire piece and takes on a drowsy hypnotic blurring surrender, while behind it, a building faraway rumble and sustaining washes of electronic veils gradually take hold, growing carefully in presence with a thick enveloping haze. Clipping programmed loops slowly enter, slinking grooves subtly lurch with reverberating cavernous groans rising in consuming power before being swept away by placid serenity, but a last minute twist teases a return to unease and mystery once more. It’s a bit of a shame that this release perhaps got a little lost in the blur of not only the live concert CD performance it was released alongside, but a string of constant releases from last year as well (including over seven studio albums, archive compilations, live performances and multi-disk box- sets! ), as well as several previous works with the `Immersion’ word in the title. It’s therefore probably easy to dismiss this as some sort of mere `bonus disc’ to accompany the defining live work it originates from, but to do so would be a big mistake. 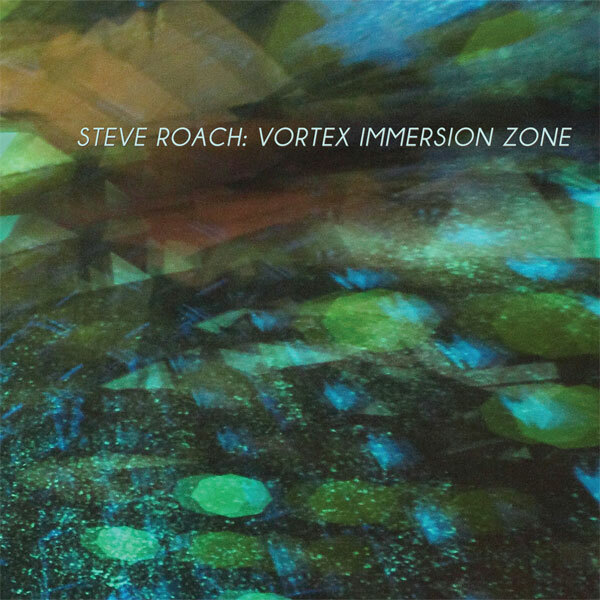 Perhaps it could have been half its length and still been just as effective, and inexperienced ambient/electronic listeners might find the constant droning elements a challenge, but Vortex Immersion Zone is bold and confident, completely captivating and powerful one moment, drifting dreamily the next. It’s truly a work originating from a master of the related genres, and it just might be one of the most distinctive and addictive studio works Roach released in 2015. Four stars (out of 5).